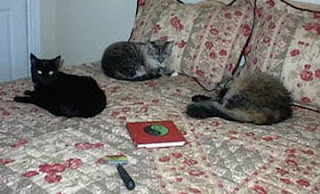 Gloria's group of kitties in South Carolina are all soaking up some Fur Shui reading by kicking back and relaxing in bed...or rather Gloria's bed! Our fur folks just seem to take over all the comfy spots. By the looks of it they are contemplating their fame gua. The fame gua holds the element of fire and that is what our animals also hold, fire energy that gets things done...also a great place for fur folks to "re-charge"! 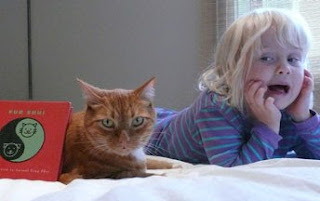 Thanks to Willie Girl (left to right), Sam and Nermal for taking a look at the book. 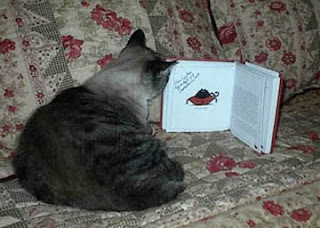 And that's Sam who is contemplating turning the page...any minute now! And, a big "hello" from my home town Encinitas which is host to the National Woody show. Wonderful old "surf's up" autos. 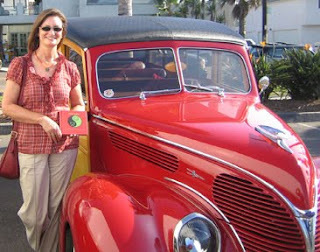 Lots of red "fired up" cars, lots of fun, lots of great Hawaiian music and joy...Fur Shui goes retro auto! Hello from Barbara and the gang of two! Both loveable fur friends are chomping at the bit to get out and play...go straight to the children qua and cut loose. Barbara is looking for an agreement between her kitties and dogs...give them some "rules" in the family gua and also amp up all their relationship energy with some nice pink around their collars. Use Fur Shui along with some flower essence treatment for better family balance! Hello to Ninja in Oceanside, CA! He is a 4 and a half year old shepherd mix, master of all things mystical and physical. His name reflects his wisdom and balance. Nancy says this: "...He is very smart and is my walking buddy. He has very good Fur Shui!" And, yes he does...well grounded on the brown earth colored couch which reflects "earth", the element of the health gua. 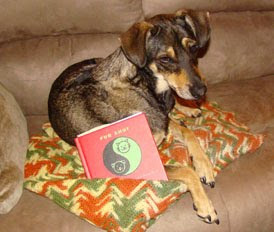 Wise to rest and read words of balance and joy with Fur Shui... so says Ninja. Sophie and Cider are pals when it comes to the children/creativity gua! 4 year old Cider entertains and is entertained by Sophie who is 5 years! They have to learn how to gently play and amuse a brand new member of the family... the latest addition, 8 month child of Molly and Gregg in Pine Plains, NY. Happy time for all, share and keep that white soft blankee in the creativity area for sure!!!!!!! "Fur Shui, got to experience a summer (or a good part of a summer) in Maine. We are located on the east side of Penobscot Bay, with beautiful water and woods. 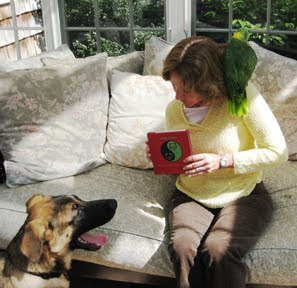 “We” includes my husband, Bob; our yellow-naped Amazon parrot Jeremiah; our two six month old German Shepherd rescue puppies (Rascal and Rogue); and our four (three previously feral, one previously abandoned) cats (Katie, Bruno, Allie, and Mishka). Lots of fur (and feathers) around here. Your book is a testimony to the importance of animals in their own right and to our sense of well-being. Thank you for allowing us to be a part of the tour." 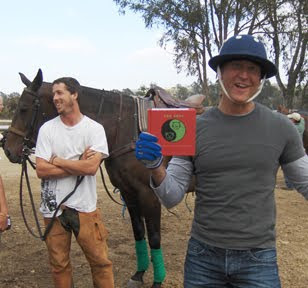 Dennis is busy with Polo skills and knowledge with learning the sport. Thanks for taking "Fur Shui" with you for a ride around the field! Note the blue helmet, gloves, t-shirt and jeans which is the color of Skills and Knowledge...happy trails in Del Mar, CA! 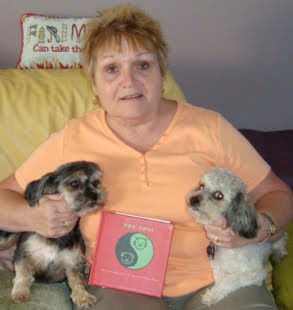 Barb has just returned from a whirlwind cross country trip with "Fur Shui" as her side kick! Below is her note to me and I thank her for taking the book cross country! Fur Shui has just returned from a 30-day, 6000 mile trip across the USA. States visited were: Nevada, Utah, Colorado, Wyoming, Montana, South Dakota, Nebraska, Missouri, Illinois, Indiana, Ohio, Kansas, New Mexico, and Arizona. 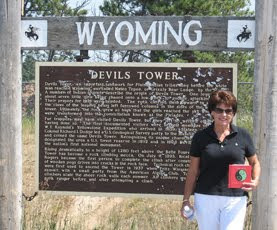 Fur Shui made some new friends and visited many interesing and historical sites along the way.....among them being: Big Horn Battlefield, site of Custer's Last Stand; Mt. 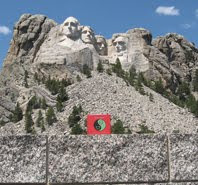 Rushmore, Devils Tower, Wyoming("take me to your leader"); Escalante Canyon Indian Petroglyph site near Delta, Co; Four Corners (intersection of Utah, Colorado, Arizona and New Mexico); Monarch Pass (Continental Divide). It was a great trip and Fur Shui is resting up for the next adventure!" 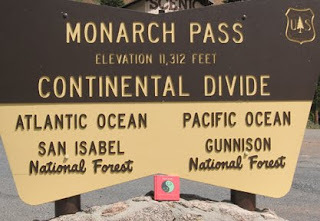 "Fur Shui" and Barb go to some pretty extreme heights during their trip cross country...scroll down to see some fun places they visited! 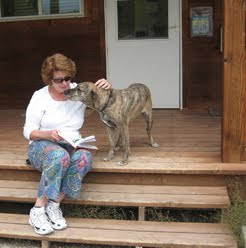 Coming back home, Barb and "Fur Shui" find a nice quiet place to rest! 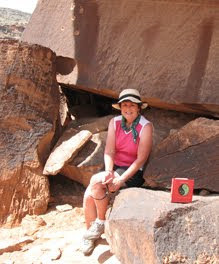 Barb spots a couple of good friends taking some time to browse through the book during its travels. Ahhhhh, have to take some time out and relax. Note the black collar on the fur friend exactly in the correct Fur Shui spot in the career gua on the front porch. Fur folks are so very smart! Barb enjoying the view at Devil's Tower. Wonder if any "visitors" from other worlds got a peek at "Fur Shui" during this stop over?! 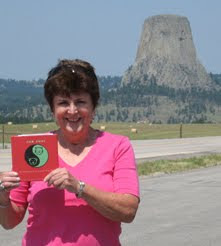 Wow, "Fur Shui" gets presidential approval as Barb visits Mt. Rushmore. 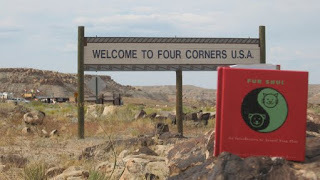 Healthy spot for all with all that stone, earth element grounding the health of all who come take a look at the monument...the book lends some California "color" to the scene...red is the color of Fame, and this sure is a famous place! Hey, if Custer had known about "Fur Shui" he would have never made his last stand...his horses most likely knew the dangers, but he just did not listen. 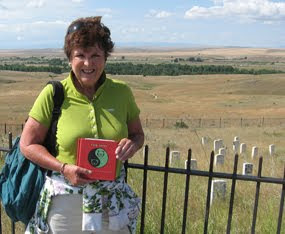 Barb and the book migrate further into the middle of the country! 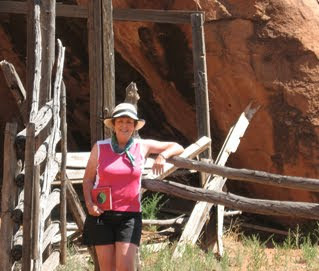 Some "mining" is at hand for Barbara and the book...dig deep into the earth and use that "element" of the health gua!